Folks, we’re warning you right now—this weekend could very likely be the last time you ever get to watch Jeff Gordon compete in a (live) NASCAR Sprint Cup Series race. The 2014 NASCAR Xfinity Series champion, Chase Elliott, will take over the No. 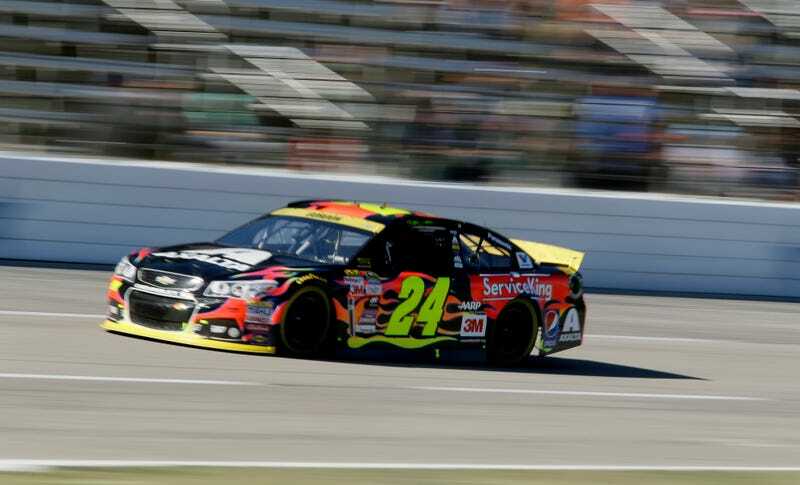 24 car following Gordon’s impending retirement at the end of the season, but Gordon has a one-in-four chance to claim one more Cup Series title before he passes the car onto his successor. The three drivers who will rival Gordon for the title at Homestead-Miami Speedway this weekend are defending series champion Kevin Harvick, the single-car team of Furniture Row Racing’s Martin Truex Jr., and Kyle Busch, who missed the first 11 races of the season due to a broken left foot and right leg sustained in the Xfinity Series race the day before the Daytona 500. All things considered, talk about a unique final four. Since it’s championship weekend, we’ve included all of the pre-race and post-race NASCAR shows on Sunday as well. If you watched Brad Keselowski’s drunken post-championship celebrations from 2012, you’re well aware that they can be pretty entertaining. In addition to NASCAR, the FIA World Endurance Championship wraps up its season this weekend in Bahrain. The championship battle in the premier LMP1 class is fairly close, with the No. 17 Porsche team of Mark Webber, Brendon Hartley and Timo Bernhard holding a 12-point lead over the No. 7 Audi of Benoit Tréluyer, André Lotterer and Marcel Fässler. The Audi group won the 2012 championship, but the last four victories this season went to the Porsche guys. The AMA Pro Flat Track Finals weekend will also feature a running of the inaugural Superprestigio of the Americas, and guys from MotoGP, flat-track competition and the like will be there. It’ll be run the night after the finals conclude on the same course, and the live-stream information is below. As for delayed race showings, the SPEED Energy Stadium Super Trucks finale from Las Vegas airs this weekend (and who doesn’t enjoy some Stadium Super Trucks racing? ), along with the Pro Motocross Championship, Red Bull Air Race, FIA World Rally Championship and Lucas Oil Off-Road Racing Series. All times below are EST.